The RevoDrive 350 is undoubtedly a great performer, but takes a knock on the cost front. OCZ Technology Group was one of the first companies to produce a PCI-Express SSD. 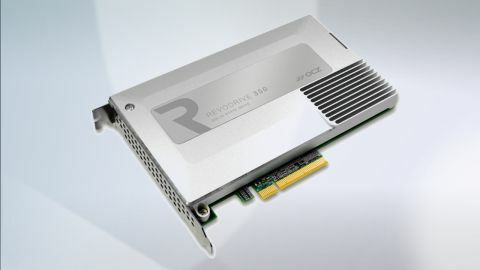 Released in 2010, the RevoDrive was a product that demonstrated the true potential of solid-state storage, with record-breaking sequential transfer speeds possible only when the drive was freed from the comparative limitations of the SATA bus. Since then, there have been more generations of RevoDrive, each iteration faster than the previous. But financial troubles have buried OCZ, with Toshiba snapping up the SSD division at the start of 2014. The brand has been retained, however, so the company is now known as OCZ Storage Solutions, but is actually Toshiba wearing a different hat. The RevoDrive 350 is the first OCZ-branded PCI-Express SSD to hit the shelves since the buyout, and therefore Toshiba's influence is sprinkled throughout. Each 19nm MLC NAND flash chip carries Toshiba's name, coupled with four Sandforce 2282 controllers. As with previous RevoDrive models, OCZ has given the performance a major boost by running the flash in RAID 0, with each controller handling 120GB in the 480GB model we received (which is priced at £580, or US$960, AU$1,035). There's a 240GB model as well, which has only two controllers, and a 960GB model. It takes the form of a single-slot, half-length PCI-Express card, with green and blue LEDs at the bottom and a heatsink covering it. The size could be slightly restrictive in tiny mini-ITX cases, but most should accommodate it fine. It uses a maximum of eight PCI-Express lanes (PCI-E x8) for a total possible 3.2GB/s of bandwidth, roughly six times the performance SATA is capable of. Drivers are provided on a small disc in the box, or can be downloaded from OCZ's site. This is important because they will be needed during setup for many operating systems. OCZ has drivers for Windows 7, Windows 8 and a few flavours of Linux including Mint, Ubuntu and Fedora. There's also OCZ Toolbox, available for Windows and Linux, which is a software package with functions for secure erase, firmware and BIOS updating, and SMART checking. PCI-Express SSDs are poised to grow exponentially soon. That's thanks to a new host bus adaptor called NVM Express (nVME), which will replace the Advanced Host Controller Interface (AHCI) standard for PCs. AHCI was designed at a time when hard disks were the only option for PCs, and many assumptions regarding latency and access times have worked their way into the standard. nVME is designed for a solid-state future, with lower processing overheads which will mean improved performance. Intel has already come up with the first range of nVME PCI-Express SSDs: the P3700, P3600 and P3500, but like its predecessors, the RevoDrive is still an AHCI-based storage device, most likely for compatibility reasons. OCZ quotes some impressive performance figures across the entire range. The 480GB model is rated as capable of 1800MB/s in sequential reading, 1700MB/s in sequential writing, 140,000 IOPS for random 4K writes, and 90,000 IOPS for reads. It all sounds incredible, considering the best SATA SSDs are limited to around 550MB/s, and about 90,000 IOPS. Other specifications listed by OCZ include some power and endurance figures. The RevoDrive uses 9.5W of power when idle, and 14W in use, and is rated for 50GB of writes a day for three years, which is as far as the warranty period extends. It's at this point that my enthusiasm for the RevoDrive starts to wane slightly. Yes, it looks great on paper, but it's a very expensive storage device, and those endurance figures look nothing special in the wake of Samsung's superb SATA-based 850 Pro, which is rated at 80GB per day for five years, and carries a ten-year warranty.